With the fast paced lifestyles that both Gold Coast residents and visitors share, people are always wanting to look their best at work and play. The professional teeth whitening industry plays a crucial role in this goal by offering customers a bright and dazzling smile in record time. But, how do you know who to chose to whiten your teeth? Local knowledge is one thing, but with so many options at hand, at with so many tourists visiting every year, we decided to do some of the work for you. There’s more to think about than just the price. Here’s what you should be thinking of when choosing a teeth whitening professional. It’s simple but important. Having a professional whiten your teeth is quick and convenient. You should leave the chair feeling refreshed, satisfied and happy. Therefore, find a place that’s easy to get to and if you're driving, offers a place to park your car. With so many options available, you should be able to find something that’s either close to home or close to work. Not everyone will offer the same method of professional teeth whitening. Different methods will suit different people and their different needs. Therefore, consider what’s best for you, and before making any final decisions, it is strongly recommended to consult with your dentist before any whitening procedure. Paying less doesn’t necessarily mean you’ve saved money. If two identical whitening treatments are on offer from different people at different prices, ask yourself: why? What is the overall value of one place over another? For example – we know that whitening toothpaste is cheap, but do you have faith that it will work when compared to professional whitening. 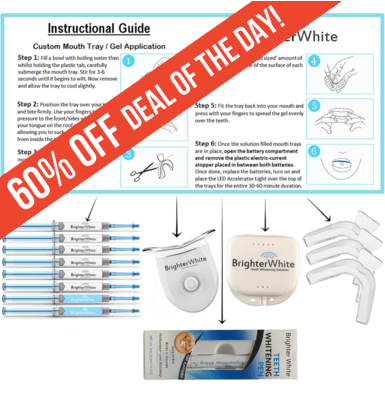 Just as there’s more than one method of teeth whitening, so there is more than one price for teeth whitening. The more expensive methods are usually (but not always) the better methods. Are there any Extras Included? Your teeth whitening doesn’t stop when you leave the chair. Your teeth won’t stay white forever, and it’s recommended that you follow up your professional teeth whitening with an at-home whitening kit. Some professionals will include the cost of these kits in the overall price, while others will ask you to purchase this separately. With these kits regularly costing hundreds of dollars, if it’s included in the price, these kits, along with any other included extras, can represent excellent value for money. You’re expecting whiter teeth. That’s great, professional teeth whitening is an excellent way to do it! But how white are you expecting your teeth to become? There’s a limit to how white your teeth can go. Keep your expectations realistic, and make sure the method of whitening you choose promises to make your teeth as white as what you’ve got in mind. With all of our considerations in mind, we’ve researched what’s on offer to bring you our Top Five Professional Teeth Whitening Providers on the Gold Coast. The team at Robina Town Dental are a talented and resourceful group of dentists who strive to provide the best care they can. Amongst their many other services, they offer the Zoom teeth whitening procedure that many other dentists choose to use. Method of Teeth Whitening: Like many other dentists, Zoom is the choice of teeth whitening for the team at Robina Town Dental. Zoom utilises a peroxide-based whitening agent in combination with an LED light to improve the results. A small, customer focussed team, The Dental Lounge Robina can create a personalised and professional customer experience utilising their many years of experience. The Dental Lounge Robina offer the Zoom whitening procedure that promises excellent results in just over an hour. Don’t miss out on the current deal that they have on offer! Method of Teeth Whitening: The Dental Lounge Robina provide the very popular Zoom whitening procedure. Zoom whitening involves the application of a peroxide-based whitening gel that in combination with the activating LED light that helps to improve the results. Looking for something a little different? Mobile Teeth Whitening is a cheaper alternative than seeing your dentist, and they promise results that are on par with those obtained from your dentist. The downside to using Mobile Teeth Whitening is that you will not be consulting with a trained dentist. As they explain on their website, you do not need to be a qualified dentist to perform the whitening procedure. Method of Teeth Whitening: Light-activated whitening gel. Treatments take about 40 minutes. An award winning and modern dental practice, TFI Dentistry represent one of the few real competitors to Zoom. With the popularity of Zoom, you might start wondering if there’s seriously any alternative competition. TFI Dentistry offers Opalescence - one of the few serious professional options to Zoom. A similar peroxide-based bleaching gel will be applied to your teeth. However, Opalescence does not use any light to assist or “activate” this gel. Smileplus Dental specialises in teeth whitening, as well as cosmetic and general dentistry. With several packages on offer, and with promises to tailor any treatment to meet your needs, SmilePlus Dental are an excellent option for those looking for more choice. While they do offer more of a choice, just like many other dentists, Smileplus Dental offer Zoom whitening as their primary method of professional teeth whitening. Method of Teeth Whitening: Zoom teeth whitening, which utilises a peroxide-based whitening gel in combination with an LED light, is again on offer at Smileplus Dental. Remember – the above is just a small summary of all of the great teeth whitening providers in the gold coast. You could easily find 10 more great options, however the above list is a great place to start comparing prices. For more information on teeth whitening and to explore your options, visit this page.